Wednesday 28th October, 7pm, at Bogan House, High Street, Totnes. I look forward to seeing you there! Without creative expression we are not fulfilled and it is not confined to arts, but extends to all areas of our lives, including business and relationships. It is not a ‘luxury’, which we ‘do’ once we have sorted out our problems, but creative process and problem solving are very similar and far from being a luxury, it is a necessity and a most practical one. Do you feel that now is the time to overcome your weaknesses and transform them into your strengths and by doing that to find the joy of discovering talents you never thought you had? If your answer is ‘Yes’ – Prepare to amaze yourself! These workshops are for everyone – whether you are an artist or a writer and wish to move on to the next level, or you just want to improve your cooking and gardening skills; or perhaps you feel that you are not creative at all, maybe because someone has told you that a long time ago and you believed it and lacked confidence ever since. You can reconnect with your potential in the atmosphere of fun, cooperation and mutual support. 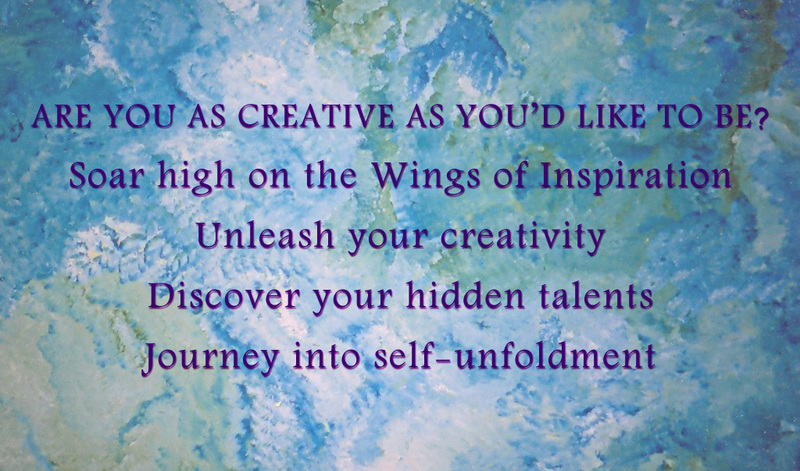 Through use of visualisation and various tried and tested techniques we can remove the blockages that stand in the way of our creative expression and unleash the flow of creativity so it can permeate our being and infuse all aspects of our lives.